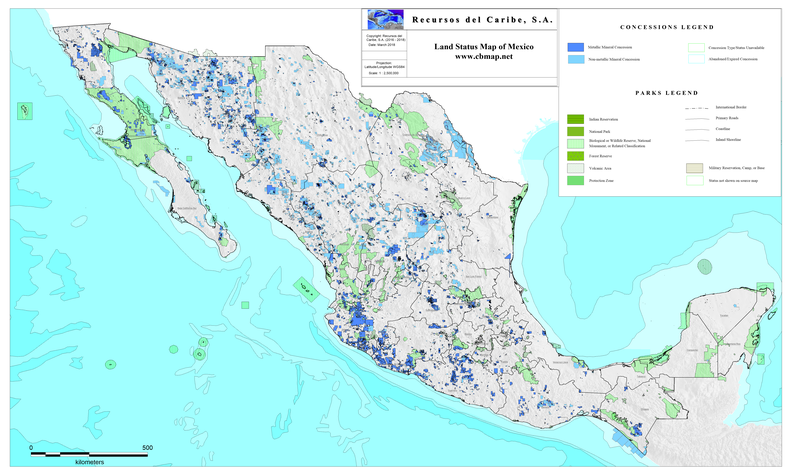 Mexico « Recursos del Caribe, S.A.
MexicoMap is a GIS database that assembles and displays information related to mineral exploration in Mexico. MexicoMap modules, designed to work together, include Geography, Geology, TS Units, Radiometric Dates, Mines and Prospects, Land Status, References and Plots. For a detailed description, click on MexicoMap readme. For a closer view, use your cursor to hover over any map. The Geography module includes shaded relief, bathymetry and major infrastructure (towns, cities, highways, political boundaries). 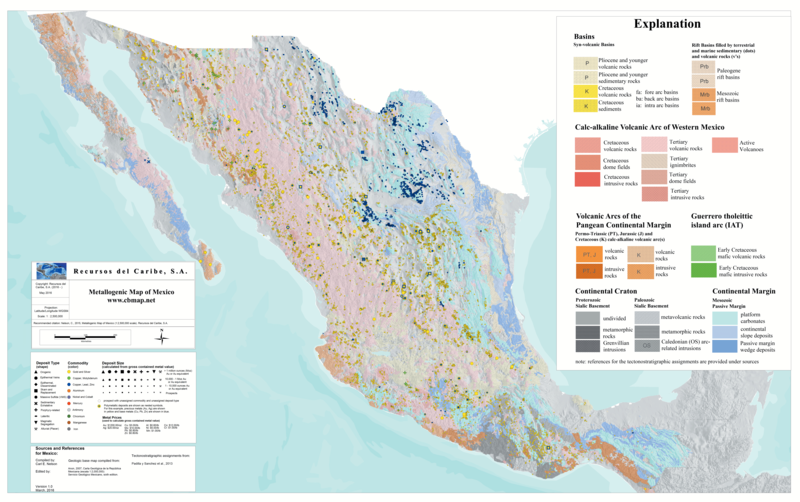 The Geology module provides a 1:2,000,000 scale geologic map of Mexico in vector format along with shaded relief and infrastructure. The TS Units module, which is built on and includes the Geology and Geography modules, provides a tectono-stratigraphic interpretation based on published references. TS Units provides the base for a metallogenic map of Mexico. The Radiometric Dates module compiles 3000 published radiometric dates attributed with sample number, sample location, host rock, radiometric date, mineral or material dated, uncertainty and a reference to the published source of the date. The Prospect module, which includes the Geography, Geology, TS Units and Radiometric Dates modules, plots known metallic mineral mines and prospects. Each mineral occurrence is linked to current information on past production, reserves and resources and references to the literature. The Prospect module can be used to plot a metallogenic map, assess prospectivity and guide exploration. The Land Status module, which includes Geography (see map below), plots the location of national parks, forest reserves and other areas of restricted mineral entry. References provides a copy, in pdf format, of publications used to compile the MexicoMap database. Plots provides metallogenic and land status maps as high resolution tiff images. Review resource and production information for individual mineral occurrences. Find references to the literature with more information on specific properties. Evaluate prospectivity by using the distribution of the tectono-stratigraphic terrane that hosts a given deposit type. Select properties for evaluation and possible acquisition. Design exploration programs to focus on a particular tectono-stratigraphic unit. Click on Prospect DEMO to see how the Prospect module works. Identify areas already covered by exploration or extraction concessions. Identify the owner of individual concessions, the contract date and the expiration date. Check for nearby parks, national forests, or other areas of restricted mineral entry. Click on Land Status DEMO to see how the land status module works. Multielement stream sediment geochemical data for 45,793 samples collected during joint surveys conducted by the United States Geological Survey and the Consejo de Recursos Minerals. Multielement geochemical data, provided in digital format (as vector files), includes analyses for Au, Ag, Al, As, Ba, Be, Bi, Ca, Cd, Co, Cr, Cu, Fe, K, Mg, Mn, Mo, Na, Ni, P, Pb, Sb, Sc, Se, Sn, and Sr. The Mexico Multielement Geochemical Database is designed to work with MexicoMap but is sold separately. Click on Mexico Gchem database for pricing and a description of the Mexico Multielement Geochemical Database.